The Breeders’ Cup people like to refer to their little bar-b-q as thoroughbred racing’s world championship event, which would be true if the best thoroughbreds from around the world all raced on dirt and they all showed up in Southern California nearly every late-October. But let’s get real. If there is any one event in all of horse racing that even comes close to “world championship” status, it is the Prix de l’Arc de Triomphe; tomorrow’s feature at Longchamp. And – despite all the sorrow that Japanese racing fans have suffered in Paris – I’m making it odds-on that these two guys (below) will be back, whether it’s for more bitter disappointment, or, for the greatest amount of joy that can be distilled out of twelve furlongs and two-and-one-half minutes. 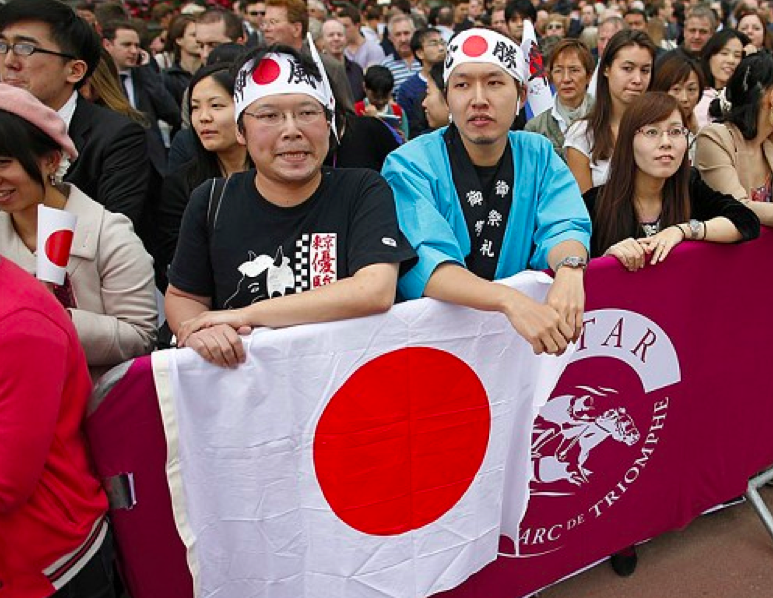 Perhaps you are unaware of how much of an obsession winning the Arc has become with the Japanese thoroughbred racing community. Allow me, then, some backstory. The Japan Racing Association (JRA) inaugurated their own international event – the Japan Cup – in 1981. This was done so that the JRA would have a measuring stick on the annual progress of their fledgling thoroughbred industry. In its first decade, what was then the richest race in the world served mainly as an easy payday for superior “gaijin” runners, with Japanese-bred horses winning only two of the first eleven runnings. But as the 1980s gave way to the 1990s, the Japanese horses started getting faster, and the better American and European horses started declining invitations to travel to the other side of the world to compete in an actual horse race. Japanese-bred horses have now won fifteen of the last twenty-two runnings of the Japan Cup, including the last eight in a row. Roughly ten years ago it became clear that if Japan wanted to continue measuring their horses against the best in the world, they would need to start playing some away games. Enter the Arc. Four years later bitter disappointment returned, as Nakayama Festa (a grandson of Sunday Silence) fell just a head short of beating Epsom Derby winner Workforce for Arc glory. But there is disappointment, and then there is the most agonizing and excruciating loss in the history of horse racing, for which “disappointment” is simply too small a word: Orfevre, and the 2012 Arc that got away. After the race, trainer Yasutoshi Ikee bowed his head saying, “I apologize to all Japan’s fans. He had enough to win. He is a top-level horse and I think we proved that a Japanese Triple Crown champion is on a par with the world’s best. He finished far ahead of the French and English Derby winners, but as this is a matter of win or lose we have to win. Well, as gallant as it was for trainer Ikee to take the blame upon himself (Does he not watch American racing? Hasn’t he heard of blaming the ground or the jockey? ), he did not improve himself enough to make any difference a year later, when Orfevre once again landed the second spot in the exacta to the runaway filly Treve. Treve does not now seem to be the same freaky filly that ran away with last year’s Arc (she strained her back over the hard summer turf at Ascot in June and finished an uninspiring fourth in her only race since then). The early favorite for the Arc – the German Derby winner Sea the Moon – was injured in his prep race and was subsequently retired. This year’s French and English Derby winners are both taking a pass on the big race. And Taghrooda, the ante post favorite for the last couple of weeks, drew an outside post position and was quickly demoted to second-favorite by the bookmakers in her native England. Germany sends out Ivanhowe, a longshot; and Ireland (dba Aidan O’Brien) sends out a trio (Ruler of the World, Tapestry, and Chicquita) that are all double-digit odds to win. So who will step forward to claim the Arc and keep the Japanese faithful saying “wait until next year”? The bookmakers and Around2Turns think the most likely winner is a 3-year-old French colt named Ectot. He has won six of seven lifetime. His win in the Prix Niel was deemed the best of the three “course and distance” Arc preps that ran on September 14th. He gets weight from the older horses and seems to run on any ground (he won the Niel on the good-to-firm turf that is expected tomorrow). If you are among those who believe that jockeys make lousy handicappers, perhaps your angle should be that Gregory Benoist had the choice between Ectot and the unbeaten 3-year-old French filly Avenir Certain and opted for the former. At about nine or ten to one, she’s probably not a bad bet, given the recent success that 3-year-old fillies have had in this race. Whatever the result, as with any race our main hope is that they all come home safely. And, if the Japanese horses once again fail to hit the wire first, we hope that they will lose in an honorable yet non-heartbreaking way. The last few years have already provided Japanese racing fans with enough pain and disappointment to last a lifetime.